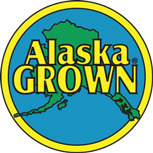 The agriculture industry in Alaska created the Alaska Grown logo to highlight products grown in Alaska. The Alaska Grown program is designed to increase consumer awareness and consumption of Alaska agricultural products. As part of the food and fiber marketing system in Alaska, you are encouraged to utilize the Alaska Grown logo in conjunction with sales of farm products grown in Alaska. The Division of Agriculture has artwork images of the logo available for producers, wholesalers, retailers, and the media to use in their efforts to promote Alaska Grown products. We encourage use of the logo on all local product packaging for vegetables, meat, milk, eggs, nursery products, honey, furs, and wool products. We also want to encourage the retail industry to develop Alaska Grown point of sale material to identify locally grown products. Our policy is to allow use of the logo on quality local products that meet the established grade standards for the top two grades for the particular item. Those products not having USDA or state grades established will be evaluated on the basis of commodity or industry association guidelines. The second issue is that all food products will be 100% locally grown except in the case of processed food items which require some condiments, spices, etc. Processed products will have at least 75% content of items grown in Alaska. Click on the PDF link below to view and print the Alaska Grown Logo Application.